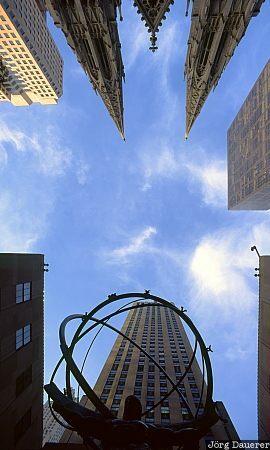 Blue sky and some clouds above the buildings at 5'th Avenue seen from the bottom of the street through a 20mm wide angle lens in Manhattan, New York, on the east coast of the United States. You can see the statue of Atlas in front of Rockefeller Center at the bottom of the image and the towers of St. Patrick's Cathedral at the top. This photo was taken on a sunny afternoon in November of 1997. This photo was the image of the month in July of 2009.